The Parkdale Panthers lost to Eleanor Roosevelt HS (pictured above) 73-51. 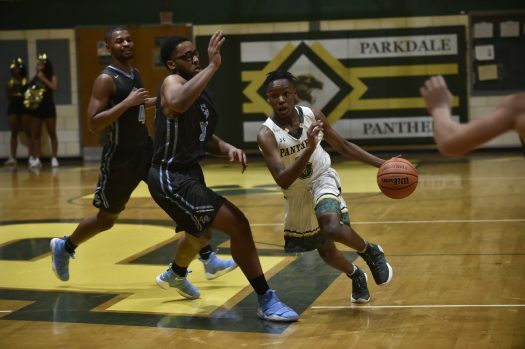 Expectations for Parkdale Boys’ Basketball were high for the season, based on their successful 2016-2017 season. Leading the charge this season were Samuel Obasi (SF,PF), Christopher Maidoh (SF,PF), Kanari Smith (SF,SG), Abdul Ojulari (PG), and Elijah Jeter (SG), the Panthers starting five. Although the strong lineup had a difficult time adjusting, with the help of the new head coach, Coach Coffing, the team put forth their best quarter to quarter. The first game of the season, the Panthers took on North Point High. High hopes and excitement for the Panthers first home game of the season turned to disappointment, as the team lost 76 to 45. However, the first game resulting in a loss of the season did not result in a loss of hope. Instead, the players built their determination to do better in the next game. Mid-season the Panthers took on the High Point Eagles and had a tremendous win. After this win, the Panther held their heads up high with a sense of victory awaiting for their next important game. The score was High Point 73 to Parkdale 54. Christopher Maidoh lead the game for Parkdale with 16 points and FG% of 47. On February 23, the Panthers faced the Bladensburg Mustangs to end their seemingly difficult season. As the first game of playoff season, many players and fans alike were hopeful that win could secure a spot in the playoffs. Unfortunately for Parkdale, they were eliminated from the playoffs. But everyone was holding their heads up from a season to learn from. Samuel Obasi lead the team with 17 points and a FG% of 58. Despite a well-fought season, the Panthers ended with a 2 to 21 record, a stark difference from their previous season where they made it to the regional championships.